Nero MediaHome is an overall media organizer which allows you to also view your multimedia files on your television and other devices which can find and connect to a media server. With MediaHome, you can playback videos and photos on external devices, organize your media collections more efficiently and turn your PC into a media streaming server. It also works perfectly with consoles such as the PS3, PS4, Xbox 360 and the new Xbox one. 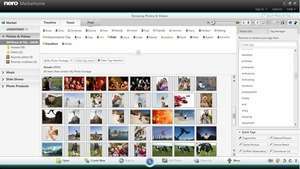 In addition to functioning as a media server, Nero MediaHome is also able to add labels to your media files, create photo books and even share things to your Facebook page. Version 2015.09.21 is a freeware program which does not have restrictions and it's free so it doesn't cost anything. For security reasons, you should also check out the Nero MediaHome download at LO4D.com which includes virus and malware tests. Additional screenshots of this application download may be available, too. Nero MediaHome has a presence on social networks. Nero MediaHome download been highly rated by our users.